When we lived in Houston, before we had Jackson, Clint and I used to head to 5:30 AM workouts at the gym together (cute, right?). After we had Jackson, we would alternate mornings, and I’d occasionally go to a post-work spin class. Either way, we made it work because getting our workouts in was a priority for us. When we moved to Michigan and I started working from home, I said I was never again going to take on early morning workouts because I didn’t have to do it anymore. While that’s technically still true, I have realized how much I actually like getting my workout done and over first thing in the morning. Having that done opens up so much space in my day and a good workout really gets me awake, happy, and in a great mood. As you know, I started doing the fitness camp a few weeks ago and those workouts are at 5:30 AM, meaning I have to get up at 5:00 and out the door shortly after to get there on time. To prep for that, a couple weeks beforehand, when Clint got up to go to the gym, I would get up and do a 30 or 45 minute spin ride on my Peloton bike. Just doing that a few days a week really got me started on a good routine and I’ve already seen good results, so it was easy to remember why morning workouts are so great. Since getting up this early isn’t a natural thing for me, I try to do a few little things to get myself up and ready to make the most of my workout, and I wanted to share those with you. Nothing revolutionary here, but just things that, when put into good practice, will make your morning workouts so much easier! I always need to eat a little something before I do a morning workout. I just don’t do well on an empty stomach and, since I want to make every workout worth it, I need a little fuel. I also don’t want to eat too much because I’m either doing pretty serious cardio or bouncing around at camp, so I just need something to get me going! 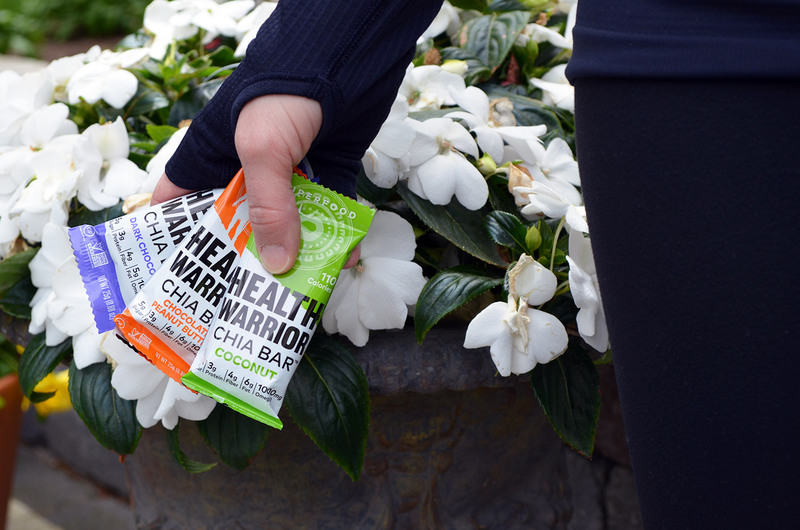 Lately my pre-workout snack has been Health Warrior Chia Bars. They’re small enough to toss into my gym bag or purse and take with me on the go. They’re also low in sugar (only 4-5g per bar, which is lower than most other bars!) and, with chia seeds as the main ingredient, they are great for energy and keeping you feeling full. Chia seeds swell in water, so even though they’re small, they keep you full for a long time. I really like the coconut flavor and also the dark chocolate; they taste like a little treat. If you haven’t tried these bars before, head on over to the Health Warrior website and use the promo code ninarand30 for a full 30% off your entire order! If I’m planning on an early morning workout, I always put my clothes, shoes and a pair of contacts out in our bathroom. I really try to make it so I have nothing to think about in the morning, it’s just going through the motions and getting to the workout. When it is an at-home workout, I scan through the Peloton app the night before and bookmark 1-2 rides that I’m interested in. If I’m heading out to camp, I keep my bag, keys and (already filled) water bottle by the door. I may not have to leave for work right after my workout, but I do have a morning full of mom stuff to do in order to get the boys ready for school before I start my other work. I usually try to have the coffee maker on and ready to go, a set of clothes ready for after I take a shower and, when I’m working out at home, I’ll throw oatmeal in the rice cooker and turn it on before I get started. Breakfast, done! I hate to feel rushed in the mornings, so I like to have the boys’ school bags packed up and ready to go, along with anything else I need to send out with Clint. Then once everyone is off, I get into a full work day with lots of energy and positivity! Do you all like morning workouts? What are some of the things you do to make yours easier? 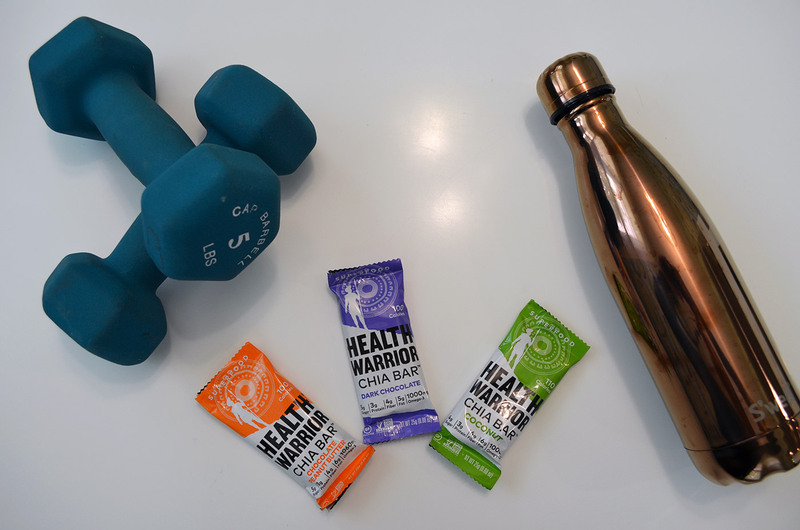 Thank you to Health Warrior for sponsoring this post. All opinions remain my own. Thank you for supporting the brands that make the HSS feed possible. This is perfect timing. I need these tips because I just started working out in the morning this week! Great tips lady! I love those bars. They’re SO good! I am the absolute worst with morning workouts! I do them for a couple weeks and then I miss sleeping in too much! haha I always felt amazing after them though! morning workouts are a must for sure!! you don’t want to be around me otherwise! These are great tips for an early morning workout! I get up for work at 5 every morning, so would need to start my workout at 4:30 at the latest. I hope to take on this challenge someday!! I bet these bars are great! you’ve got a great routine going here! as much as i love working out, mornings will never be something that works for me because it’s when my health is the worst (i have a chronic digestion disease) so i gotta opt for evenings. however, all these still apply and i still need my energy, so those bars sound great! Love those leggings.. looks great on you!!!! I need to make time for working out. I have been slacking.